Here are some short book reviews. Some of them may be harsh. Feelings may be hurt. If you are of a sensitive disposition, you might want to look away. On the other hand, if you feel that a book review is just, well, a book review, then read on. You might well disagree with my assessments, it happens. And while I’ve been doing this a long time – my first book review, of CJ Cherryh’s The Tree of Swords and Jewels, was published in 1988 – and I try to be reasonably objective in discussing a book’s faults or successes, how I respond to any piece of fiction is subjective and that’s going to colour, if not inform, my review. But as a general rule, good books tend to get positive reviews, bad books get negative reviews. 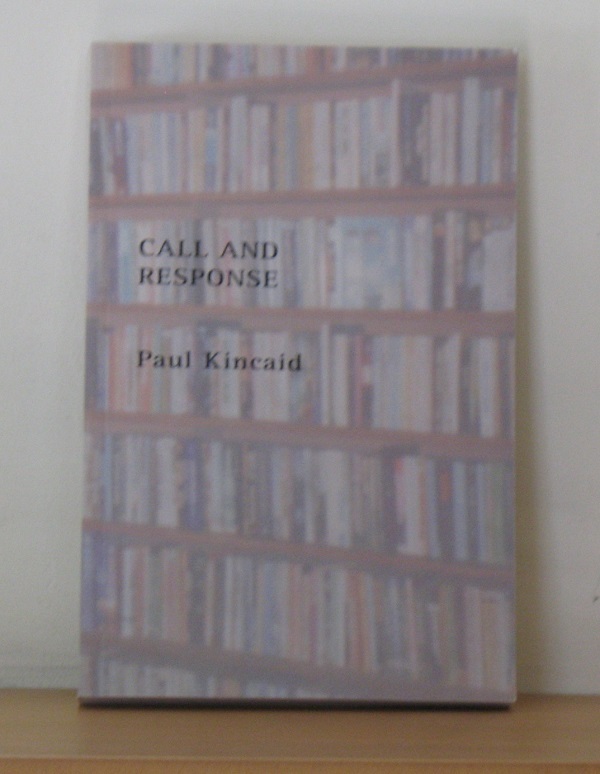 Unless, of course, there’s something about the book that I really don’t get on with, irrespective of its quality – but I will say as much should that be the case, so you can decide for yourself. 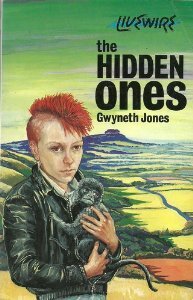 The Hidden Ones, Gwyneth Jones (1988) This was a re-read, and I’m not sure what prompted it. Never mind, I’m glad I did re-read it. It’s the only YA novel Jones has written under her own name – apart from four books written as by “Gwyneth A Jones” back in the late 1970s – and was, I believe, written specifically for The Women’s Press’ YA imprint, Livewire. As far as I can determine, Livewire only published one other sf YA novel, Skirmish by Melisa Michaels (AKA Melisa C Michaels) in 1987, and that was a reprint of the first book of a five-book series originally published in the US by Tor between 1985 and 1988. (Interestingly, it doesn’t seem to have been published as YA in the US.) But The Hidden Ones… Adele is, to put it mildly, a troubled teen, but this may have something to do with her somewhat erratic, but powerful, psychic abilities. After getting into trouble once too often, she is sent to live with her divorced father, his new wife and their son, in the village where Adele originally grew up. Determined not to fit in, Adele wanders about the surrounding countryside and discovers the Den, a picturesque and untouched hollow in the nearby hills. But it seems the farmer who owns it has sold it to someone who intends to despoil the Den by mining it for lanthanides. Adele, a reluctant heroine, saves the Den, but it does not change her or rehabilitate her. There’s some nice writing in this – as you’d expect of Jones – particularly of the countryside, and Adele is a typically Jonesian heroine, all spiky and ill-fitting; but this is not a story about good deeds or redemption of prodigal daughters. Adele has a justifiable distrust of adults, and nothing happens in The Hidden Ones to make her think otherwise. If there’s a lesson here, I guess it’s that we will always need our rebels. First on the Moon, Hugh Walters (1960) I picked this up at the Eastercon because I thought, from the title, it was a pre-Apollo story about a Moon landing. And I read it this month for my contribution to Pornokitsch’s Friday Fives series – which I did about 5 Trips to the Moon. It turned out the title was a bit of a misnomer. 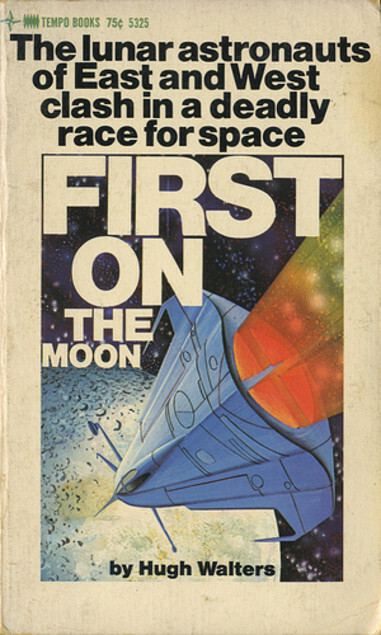 For a start, First on the Moon is the third book in a series, and was originally published in the UK as Operation Columbus. It’s a juvenile (ie, YA), and not very good at all. The science is rubbish, the geopolitics nonsense, and the plot which drives the story complete tosh. Apparently, in an earlier novel, mysterious domes on the Moon bombarded the Earth with radiation, so the UK sends plucky teenager Chris Godfrey to bomb them from lunar orbit. 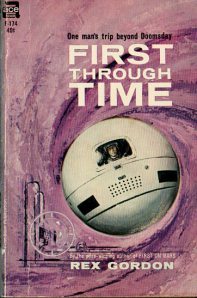 In this book, Godfrey is sent on a second mission, this time with the intention of landing on the lunar surface and finding some clues about the origin of the mysterious domes. The Soviets decide to do the same as well, so there’s a bit of the old Cold War rivalry going on as well. The intense claustrophobia of a space capsule plus zero gravity is, according to Walters, severely debilitating, so Godfrey is drugged for his flight to the Moon. On the return flight, he hitches a ride with the Russian (who had destroyed Godfrey’s spacecraft because Cold War) and the claustrophobia causes them to pummel each other. Oh, and the domes are never explained – no doubt Walters left that for another book in the series… and there are twenty of them in total. I won’t be reading any of those other nineteen. The Revolving Boy, Gertrude Friedberg (1966) I bought this at Fantastika in Stockholm last year. I’d not come across Friedberg before, and this appears to be her only published novel. I’d been told it wasn’t very good, but I must admit I liked it. Its premise was a bit silly, but Friedberg could manage a nice turn of phrase. I reviewed it for SF Mistressworks, but my review has yet to appear there. 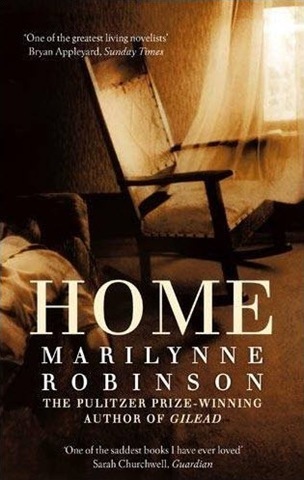 Home, Marilynne Robinson (2008) I must admit, I wasn’t expecting the story of Home to be set alongside that of Gilead (2004). And I see that Robinson’s most recent novel is Lila (2014), and Lila is a character in Home – so this new novel must also be set in the town of Gilead too. Glory Boughton has returned to the family home in Gilead to look after her ailing father, a retired reverend. Also due to arrive is long-lost son Jack, who has spent the years since he left home living on the fringes of society, an alcoholic, unable to hold down a job, in and out of jail, and now so frazzled by his own failure at living – though he has been clean for a decade – he trusts himself even less than those who know him. Home is a beautifully-written exploration of the relationship between Glory and Jack, and the lives they have led, especially their failures, and the pair’s relationship with their father. Their father’s closest friend is Reverend John Ames, whose letters to his son form the narrative of Gilead. If I thought Ames in Gilead felt a little too… comforting to fit as a country reverend, in Home Jack feels a little too self-reflective and sensitive to (often unspoken, frequently imagined) criticism. This doesn’t detract from the wonderfully-observed relationship he has with Glory, or indeed from Robinson’s lovely descriptive prose. But you do sometimes get the impression the people in her books are a little too… thoughtful to be entirely true to life. Nonetheless, I’ll be picking up a copy of Lila. 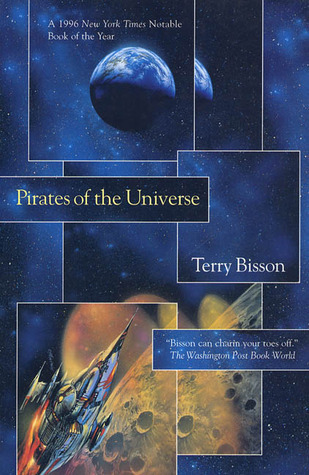 Pirates of the Universe, Terry Bisson (1996) I’d been after a copy of this for years after reading and enjoying Bisson’s Voyage to the Red Planet back in the early 1990s. I did manage to find a copy in good nick on eBay a few years ago, but the seller refunded my money after, he explained, he’d had a “scissors accident” with the book’s cover while packaging it to post. Unfortunately, I think I may have left it too late before reading this book. Back in the 1990s, a future run by corporations in some sort of neoliberal dystopia might have seemed like jolly clever satire, now that we’re living it the joke’s worn a bit thin. True, the real world is not as bad as Bisson paints his – for a start, there’s been no World War Three, which seems to have reduced the bulk of the population of the US, if not the whole world, to subsistence levels. The plot actually concerns the farming of “Peteys”, which are some sort of pocket universes about the size of a small asteroid, which appear in cislunar space at irregular intervals. Their “skin” can be harvested and once cured is the most valuable commodity on Earth. The protagonist is a ranger, one of the hunters, and he gets involved in some plot, triggered by his brother’s escape from prison, when he goes on furlough on the Earth’s surface. There’s some nice invention on display here, but it all felt a bit past its sell-by date – not like the ideas were dated, but like they were larval forms that have been expanded and re-used many times in the decades since. Which, in some perverse fashion, did make bits of the book actually read quite modern. Sort of. Path into the Unknown, anonymous, ed. (1966) I’ve seen a few places on-line claim Judith Merril edited this, but I can find nothing to substantiate that. The book itself names no editor, nor indeed any original publication data for the stories it contains. Which is bloody annoying. I’d liked to have known how old some of the stories in this anthology were, as one or two felt considerably older than others. Also bloody annoying is this need in sf to translate foreign fiction into US vernacular. Translate it into English by all means, but don’t throw away the flavour of the original by trying to recast it as middle-grade Twain or something. You’d only know the stories in this anthology were originally published in Russian by the characters’ names. And, well, yes, by some of the plots as well. ‘Meeting My Brother’ by Vladislav Krapivin had a nice central conceit, but was too long to carry it. ‘A Day of Wrath’ by Sever Gansovsky, on the other hand, was actually pretty damn good, and probably wouldn’t have looked out of place in a best of anthology in 1966. 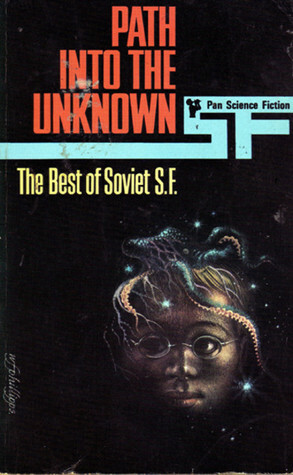 The remainder of the stories, including two by the Strugatskys, were mostly forgettable; and one, ‘The Purple Mummy’ by Anatoly Dneprov, read like something from the 1930s. Not an especially good anthology, but an interesting read as an introduction to another science fiction tradition. James Tiptree, Jr: The Double Life of Alice B Sheldon, Julie Phillips (2006) I started reading Tiptree in the late 1970s, and I knew from the start “he” was a woman as his real identity had been revealed a couple of years earlier. Over the years, I’ve sort of picked up bits and pieces of Tiptree’s “biography” – a woman who worked for the CIA, and used her work skills to create the fake identity James Tiptree, Jr. Why she went to so much trouble for what is pretty much a pseudonym, well, I never really thought about that. 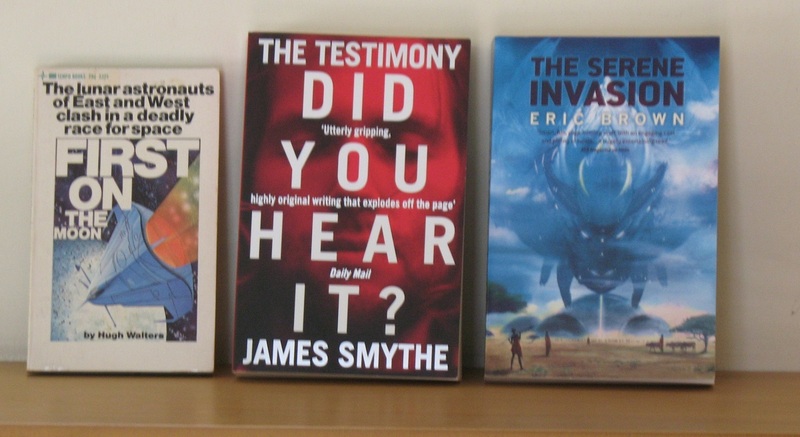 But I rated her short stories – especially ‘And I Awoke And Found Me Here on the Cold Hill’s Side’, which remains a favourite sf story – and at one point during the early 1980s bought as many of her books as were available at the time. And now, having read James Tiptree, Jr: The Double Life of Alice B Sheldon, it seems that what I thought I knew about Alice B Sheldon turns out not have been true after all. Yes, she did work for the CIA. But only for three years, and it was more than a decade before she started writing sf as Tiptree. She was also considerably older than I’d expected. She was born into Chicago’s upper crust in 1915, and even went on safari to Africa at the age of six. And again several times afterwards during her childhood. During WWII, she worked in photo-intelligence, which is where she met her second husband, a colonel in USAAF intelligence, and she even assisted him as he darted about post-war Europe grabbing up all the scientific and technological goodies for the US. Only later did they join the CIA. She lasted three years then went to university to study psychology, eventually earning a doctorate. Of course, reading this book made me want to read more of Tiptree’s short fiction – so I really need to get a copy of the new SF Masterworks edition of Her Smoke Rose Up Forever. 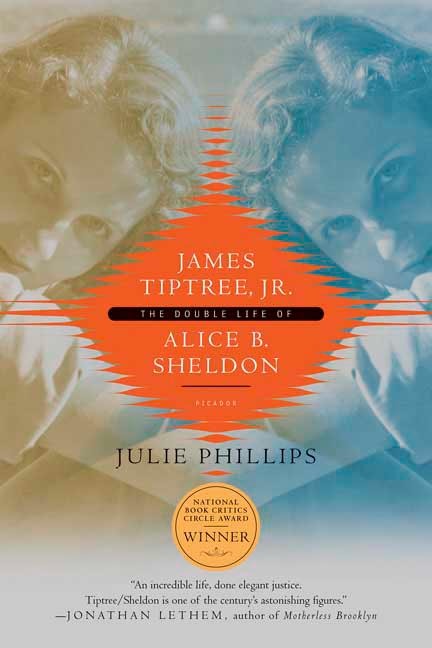 James Tiptree, Jr: The Double Life of Alice B Sheldon is an excellent biography of a fascinating writer, who actually proved to have led a more interesting life than common knowledge about her has suggested. Recommended. 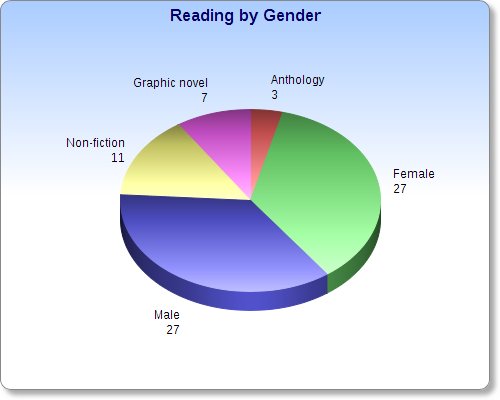 And since we’re about halfway through the year, here’s a breakdown of my reading stats by gender. I’ve separated out anthologies, non-fiction and graphic novels as categories of their own, so “male” and “female” only refers to book-length fiction (ie, novels, collections, or novellas published as standalones). Every time I finish a book by one gender, I pick up a book by the other gender. And you know what? It’s piss-easy to do. You do it like this: I’ve just finished a book written by a man, so now I will read a book written by a woman. And vice versa. It’s so simple! It’s foolproof! I bet you could do it too! Go on, give it a go. Categories: book review, books | Tags: gretrude friedberg, gwyneth jones, hugh walters, james triptree jr, julie phillips, marilynne robinson, rex gordon, soviet sf, terry bisson | Permalink.